A cork ball on the top of a wooden pedestal carries a board outbalanced by about 25 wooden pieces. These pieces have different forms,sizes and weights (!). In turn, every player takes away one of these pieces from the board, still trying to keep the balance. Some slope positions of the board seem next to impossible - when it tumbles, the game is over. The player who was able to put aside the most pieces, wins. Wooden objects of different shapes and sizes are balanced on a wooden plate, then balanced on a ball on a stand. In turn players remove one object from the plate without tipping the entire plate off the stand. Points are scored for each object successfully removed, and the first player to reach 30 points is the winner. 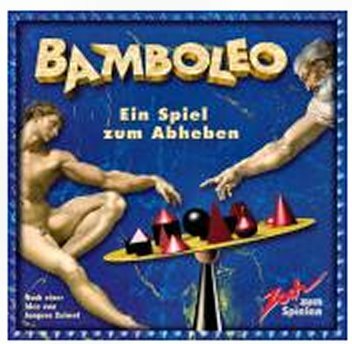 Bamboleo is probably the only dexterity game I've tried, where I can do well even without having good dexterity. This is because the dexterity element is fairly limited (you just need to pick up pieces from a board), whole the meat of the game is actually more like a logic puzzle. The challenge is in deciding WHICH piece to pick up, by trying to predict how the remaining pieces affect the board. I think it is a great party game, and everyone can join in - even those of us who have less nimble fingers. Ever tried really GOOD dexterity games? This is one of the best! It's not easy to find, but if you do I absolutely recommend picking it up!